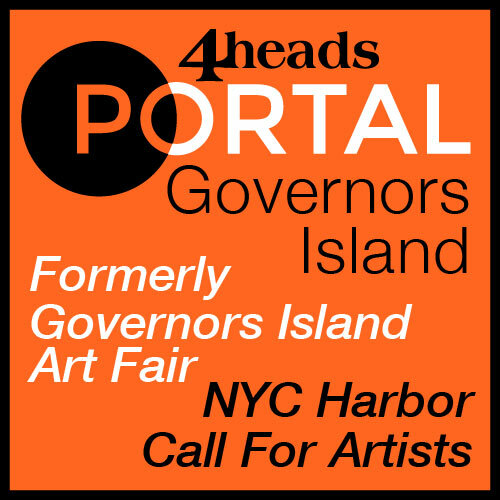 4heads announces a call for artists for the 12th Annual Portal: Governors Island (formerly Governors Island Art Fair), New York’s largest independent exhibition. Portal will feature scores of artists of exceptional talent. Each will be awarded an exhibition room or large outdoor space in the historic and beautifully dilapidated buildings of Colonels Row. The lines between artwork and its environment are blurred across the lawns and landmark houses of bucolic Governors Island. Once selected by 4heads jury, your 12th Annual Portal: Governors Island exhibition space is free. The entire massive event is free to the general public. Touted as New York’s largest independent exhibition, Portal: GI welcomes over 40,000 visitors annually in New York Harbor. You are free to present your work, your way, at this acclaimed independent art fair in New York City. Because 4heads works hard to keep artists’ costs to a bare minimum, gallery scouts, journalists, and collectors know that this is where to find the freshest talent. They come back every year to see what’s been discovered. Many past Portal artists have launched their art careers here. The NY Times succinctly identified 4heads’ target audience with the headline, “Art Fair for the 99%”. They aim their 12th Annual Portal: Governors Island outreach to the public and artists alike. They are an economically and culturally diverse population of all ages as well as non-arts-going audiences. Portal:GI exhibitors are over 50% female, 35% non-white, and ages 14 to 89. Arts education outreach youth participants, who also show at Portal:GI, are 70% female and 80% non-white, including 85 children from AHRC NYC with developmental disabilities. Education program youth participants raise awareness for nonprofits including Lower East Side Girls Club, Chinatown Y, Two Bridges Neighborhood Council, and AHRC NYC, who serve children with developmental disabilities and K-12 youth from underserved communities. 4heads is the New York City non-profit organization created by artists for artists that has produced Portal: Governors Island since 2008. As an artist-created organization, 4heads cultivates a supportive community by hosting free, large-scale art fairs and studio residency programs for under-represented artists. They tailor arts education programs for underserved youth. With a strong focus on artistic excellence and inclusion, 4heads revitalize historic spaces with contemporary art. They continue to enrich and expand the creative community – a socially, economically, and culturally diverse reflection of New York City itself. For more information, contact info@4heads.org.